We are currently testing the site in a private beta. If you are interested in participating, please contact us. Track stats in different categories and quickly gauge player performance at all levels. Powerful stat analysis helps coaches to troubleshoot team weak points and emphasize team strengths. Player pages showcase statistical milestones and achievements as well. See how you stack up with the competition. 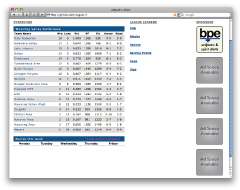 View site rankings at different levels, from districts down to an individual team. Team rankings make it easy to see where your team stands, and league leading players in each statistical category are provided at all levels. Get the information you want and need without hassle. We provide a simple, yet effective user interface for viewing site content and a secure administrative section for coaches or league officials to enter data. The easier it is, the more you'll use it! boysvb.com assumes no liability for site content, nor do we verify the accuracy of statistics entered on this site.